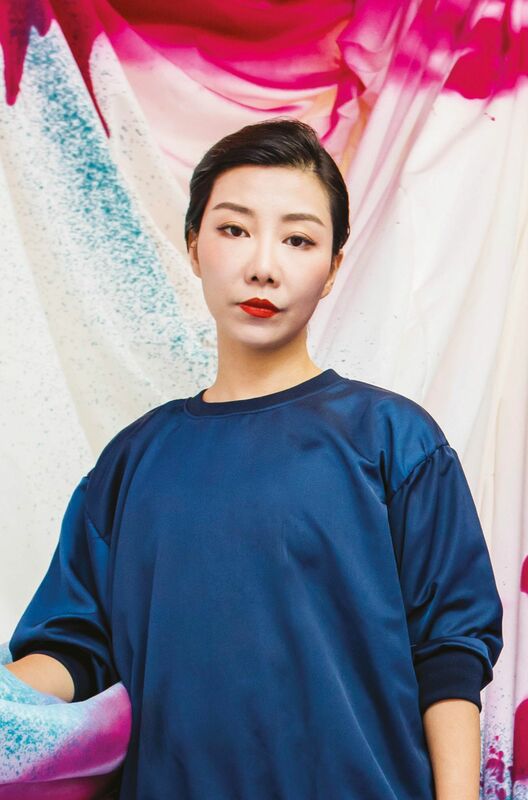 Venus Lau, the artistic director of the K11 Art Foundation (KAF), was shopping for a highlighter at the beauty counter when she instead happened upon the idea for the organisation’s next exhibition. But make no mistake, Glow Like That, which opens to invited guests at Victoria Dockside during the week of Art Basel in Hong Kong, is far from a straightforward group show musing on a linear theme of beauty. Anyone who has come to know KAF through its exhibitions over the years could guess as much. Lau’s first curatorial effort after joining K11, last year’s Emerald City, was as multifaceted as its titular gemstone, and purposefully so—it was Lau’s intention to interpret the term in myriad ways, from superficial to metaphorical, allowing the artists a loose leash to explore various minutiae relating to geology and geometry. As a show, Glow Like That is in many ways more amorphous, more ethereal and more esoteric, despite its seemingly approachable moniker. Even within the cosmetics industry, a world that is predicated equally upon concepts both artistic and scientific, there isn’t a standard definition for the term “glow.” Yet it is a concept that is so very familiar. While Lau contemplated flecks of glitter, she also meditated further on that inner glow so coveted in the wellness industry, on the glow of reflective surfaces, on the glow of city lights against the night sky, the glow of computer screens and the ubiquitous smartphones illuminating our enthralled faces, the glow of radiation. As such, the line-up of artists involved is as diverse as her train of thought. As KAF’s mantra is to incubate contemporary-art talent in the China region, the show is heavily populated with younger Mainland Chinese artists. Video artist Chen Zhou, who works symbolically with colour, will present the 2017 video work Blue Hole, which uses a filter whose hue dovetails with that used by Microsoft Windows in what is colloquially termed “the blue screen of death.” Thematically, the work brings together characters and dialogue to explore the alienation that comes from travelling too deep into the online world. Chen Wei’s installations from the series Trouble, on the other hand, use found neon lights in various forms to impart a seedy glow and elicit a sensorial reaction from viewers, an evolution from his photographic practice and best-known work, which features disconnected nightclub attendees illuminated by disco lights. Donna Huanca is one of the few exhibited artists whose work interacts directly with the show’s originating concept; the Bolivian-American artist uses the human body and skin as subject, canvas and tool. American minimalist artist Larry Bell’s glass sculptures, on the other hand, explore how the refraction of light changes perception. Among the other participants, who range from KAF regulars Zhang Ruyi and Mountain River Jump! to emerging Mainland Chinese artists, including Yu Honglei, and established names such as DeWain Valentine, sits one odd man out: the men’s hybrid wellness-streetwear brand Advisory Board Crystals. Following a collaborative limited-edition fashion project with Ai Weiwei, Advisory Board Crystals’ very involvement with Glow Like That is considerably more significant than whatever they contribute. No matter what they present, it will speak to an audience that isn’t merely cerebral art lovers and in-the-know collectors looking for the next name anointed by mega-benefactor and KAF founder Adrian Cheng. ABC, as they refer to themselves, looks to package wellness for the streetwear-loving hypebeast generation in boundless formats—and their inclusion in the show will in turn broaden interest in what has for many years been a highly conceptual endeavour whose primary objective was to establish KAF’s art-world authority. Now that KAF is in its second year producing a show alone (prior to Lau’s joining last year, the foundation had worked with Moma PS1 and Palais de Tokyo, and has used Serpentine Galleries’ Hans Ulrich Obrist as curator), it is an opportune moment to do what has been Cheng’s mission statement from the foundation’s inception: to bring fine art to the masses, much as he hopes to do with the forthcoming K11 Musea. Which is why the idea of Lau—a rather serious curator, whose credentials include exhibitions for the Ullens Center for Contemporary Art, OCAT Shenzhen and Para Site in Hong Kong—shopping for facial highlighters in order to attain that elusive glow is a rather amusing and appropriate starting point in understanding how Glow Like That came to be, and how a seemingly everyday incident can spark a greater conversation that delves into uncharted territory. “Art and beauty intersect sometimes, but in the end, what is beauty? There may be people equating beauty with superficiality, something easy to digest, and art should be something ‘shocking,’ something deep,” muses Lau. “I don’t think they are that mutually exclusive. [The poet] Rainer Maria Rilke was often quoted for his line, ‘For beauty is nothing but the beginning of terror which we are barely able to endure.’ There is a fuzzy boundary between beauty and horror or something that shocks us.” Glow Like That looks to explore these boundaries—and hopefully, its afterglow will blur the line even further.